This is great mate! Solid group you've been handed though! Ha ha I've been thinking recently that a Milan story would be fun! Good luck Rick. Emile Mpenza is a freebie legend! Keep going mate, done well to replace the squad. 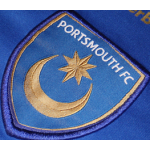 Charlie M commented on: Up Pompey! Not doing too bad at all mate considering the challenges you are having. Charlie M commented on: Up The Owls! Love the updates bud, tidy. In some good form as well. Bonus.